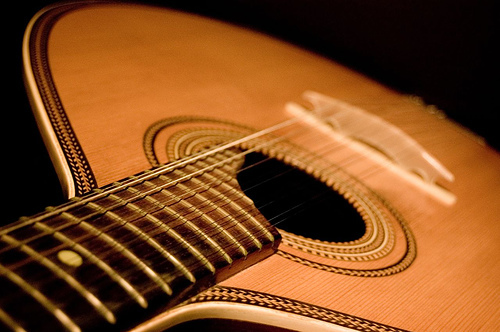 The origin of the Portuguese guitar is a subject of some debate. Fado historian and luthier Ron Fernandez has cogently argued that the guitarra is directly descended from citterns imported from England in the 1700s. Throughout the 19th century the Portuguese guitar was being made in several sizes and shapes and subject to several regional aesthetic trends. A sizable guitar making industry flourished in Coimbra by the late 19th century, propelled by the Portuguese guitar’s popularity among the students of the city. Eventually the developments of the local luthiers led to the modern model, named after the city. Over the first half of the 20th century the Portuguese guitar underwent standardization into two distinct models and enjoyed several technical improvements, such as the refinement of the tuning mechanism and the revision of its dimensions, retaining throughout the process, however, its overall appearance and distinct sound.